In lieu of candles, I use tape. Makes finding tape easy and is a fun conversation piece. I'm a horrible driver. My friends insist on driving when we go anywhere together. I'll admit I'm a bit absentminded. Being directionally impaired doesn't help either. One of my favorite bookstores is closing and I'm sad. Very sad. My family went to say goodbye this weekend and we bought books on their 40% off sale. The sale was nice, but it didn't make up for the fact that I'm now minus a bookstore. WHAAA! I wore glitzy ballet-type shoes to an uppity banquet the other night only to look down and discover the jewels had fallen out and in their place were gaping holes. Zikes! I kept my legs under the table for the rest of the night. Jennifer introduced me to Truth Thursdays and this is her birthday week so go check out her blog, Unedited! Are there any truths you'd like to share? Love your tape candle. Very creative. As for the bookstore, that really stinks. Hm, you needed some of that colorful tape to repair the missing jewel shoes! Thanks for the birthday shout out you are too sweet!!! 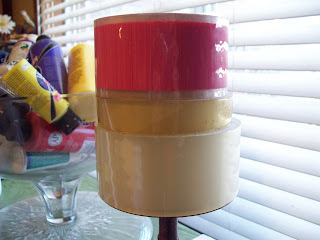 As for the tape I love that idea!!!! Oh no about the bookstore!!!! I really hope mine doesn't disappear I love it so much!! Sales just aren't the same if the bookstore itself is disappearing. I just joined the A-Z challenge, too. See you through the alphabet!